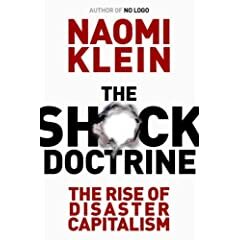 I’ve recently had the luxury of diving into the Naomi Klein’s international and New York Times bestseller The Shock Doctrine: The Rise of Disaster Capitalism. A well researched and an engaging read, this is not a very cheerful, but certainly a thought-provoking, book. It highlights the subtle power of academia in the society. Take, for example, Chicago’s School of Economics record of influence under the intellectual leadership of Milton Friedman. Or, say, the power of a particular funding mechanism in shaping scientific inquiry and controlling access to new knowledge and ideas. At least in theory, the conduct of science must always be insulated from political interference. Scientists themselves work in institutions that are products of politics, economics and culture. As with any other complex question, there is probably no single answer, rather an interplay of pure and applied research. See, for example, discussion about open access medicine and scientific information from a previous blog. Most of the debates have centered on the intellectual property rights. A wide spread open access movement, such as PLoS, and others discussed on this blog, offer a direction in the area of dissemination of information. It is an acknowledged paradox that the problems impacting 90% of the world’s population receive ten per cent of the total resources devoted to science research. Modern science and technology are responsible for the amazing prosperity and other benefits enjoyed in many parts of the world. How can we ensure that our efforts in developing and applying science, and cultivating its social benefits, aid development?